Fresh Invest are happy to bring to market a new Property Investment opportunity on the West Coast of Barbados. The development comprises 14 boutique apartments on this beautiful stretch of coastline affectionately named “The Platinum Coast” due to its pristine beaches and turquoise waters. Fresh Invest have negotiated some brilliant early purchasing prices on this Barbados Property development. 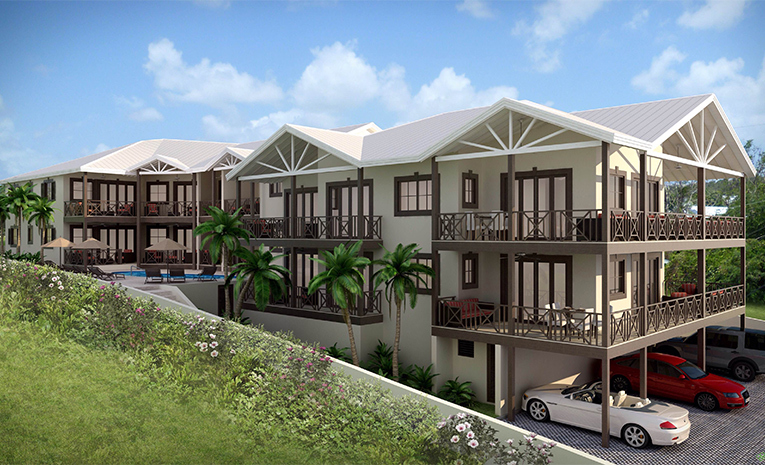 With prices starting from US$245,000 Zinnia, St James will offer one of the greatest purchasing opportunities in Barbados..
Zinnia, St James comprises 14 units in total. 6 x 1, 6 x 2 and 2 x 3 bed apartments. The development has been designed with luxury in mind, whilst maintaining a level of affordability, which is unparalleled on this stretch of coastline. The highly experienced development team along with a revered local contractor will carry out the development. The specification and finishes will form part of the sales contract, meaning clients will receive exactly what they are expecting upon completion. The West Coast of Barbados and in particular St. James is home to many of the most well known celebrities from around the world. Due to the exceptional demand, property prices in these areas are very strong and the rental market provides excellent returns for property owner’s year upon year. The developer is offering an attractive staged payment plan, which should open the opportunity up to a number of investors. Not only does the excellent staged plan mean that investors do not have to commit a very large level of funds at the development’s infancy, it also gives a higher level of security to the project. Fresh Invest work very closely with this developer and if there are investors who would prefer to put down a larger deposit now and use a mortgage to fund their completion balance, this can be arranged… Please enquire for mortgage details. Fresh Invest’s highest priority is to make sure that investor funds are safe throughout the build period. The developer makes all payments for building works and materials up front and requests are then made to purchaser solicitors for release of funds following that particular stage of construction completion, this means that investors are never over exposed to an undeveloped site. An architect or Quantity Surveyor independently signs off, each construction stage maintaining maximum transparency. The West Coast of Barbados is presently one of the most popular holiday destinations in the world. This level of demand every year has meant that those positioned correctly in the rental markets have been earning fantastic returns every year. Zinnia will be in the perfect position to capitalize on the huge demand this stunning stretch of coastline brings. With the excellent purchasing prices yields will be strong. If you are interested in this development, please use the request information tab at the top of the page to receive all of the details including the proposed pictures and floor plans. Once all of your questions have been answered, Fresh Invest will guide you through the quick and easy reservation process. Putting you on your way to owning your very own West Coast Barbados retreat!